← life was so simple back then. Wow. Today is an absolutely beautiful day. I plan to spend all of it outside, with a cup of coffee, doing my school reading. I had a pretty awesome workout on Thursday night. I was thinking about doing a Billy Blanks tape, but decided against it on the grounds that I didn’t want to. Which usually never, ever makes me change a workout plan, but I’m trying to go with what my body wants, rather than what my head wants. And my body wanted some ab work. So I popped in Circuit Training With Jackie Warner and did her Abs Circuit, which left me burning! I then completed 40 minutes on the elliptical while watching the 2009 Star Trek (such a great movie). Prior to my workout I ate half a frozen banana with 1/2 tbsp of cashew butter. Again, bringing on the fat. My dinner was glorious. 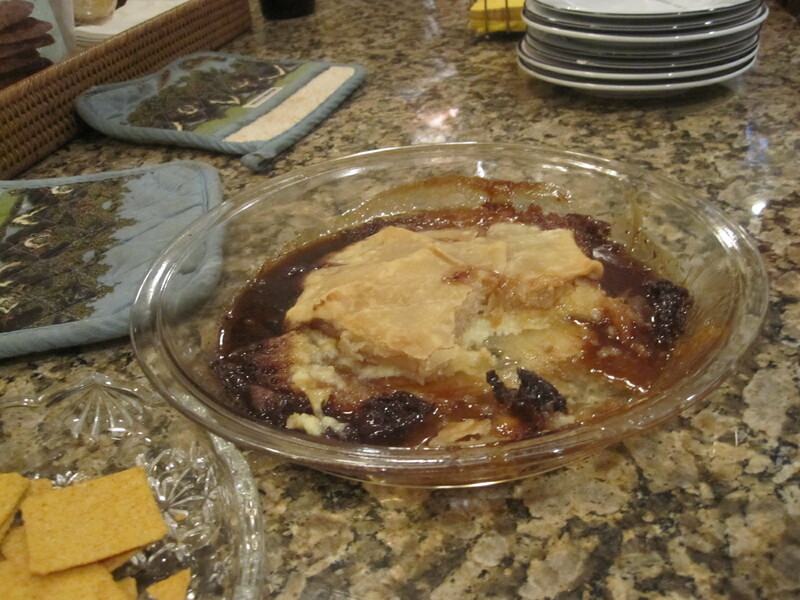 Mom had some people over for dinner and made her baked Brie pastry, which is the simplest thing to construct: Insert a wheel of Brie cheese inside a frozen puff pastry, cover with brown sugar, and bake in the oven. I managed to dip a Wheat Thin into the hot sugar crust before it hardened. Amazing! 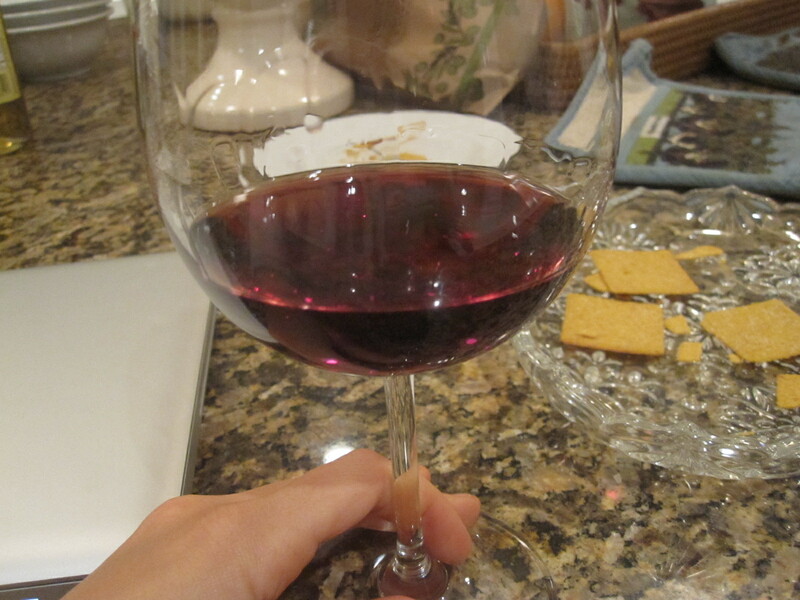 I also enjoyed a glass of red wine as dinner was prepared. As for dinner itself, Mom made pasta with meat sauce but I’m trying to cut back again on my red meat intake, plus I’m still not sure if pasta will mess with my tummy, so I decided on some leftover kabob veggies and chicken from Tuesday night that my brother in law had made, plus I cooked some vegan ‘cheeze’ polenta with nutritional yeast instead of parmesan and some almond milk. I topped it off with some pasta sauce and some roasted peppers. 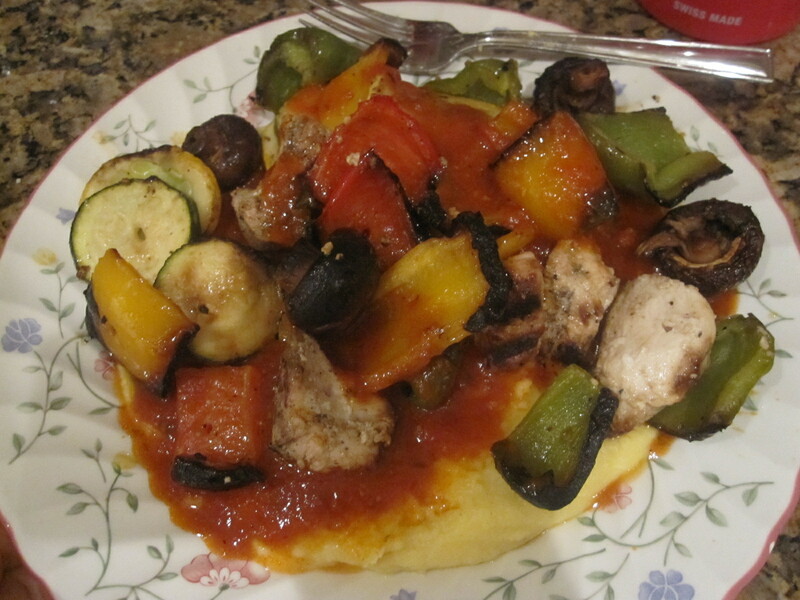 Amazing, however it’s shocking how much seasoning you need to put into polenta for it to taste like anything. 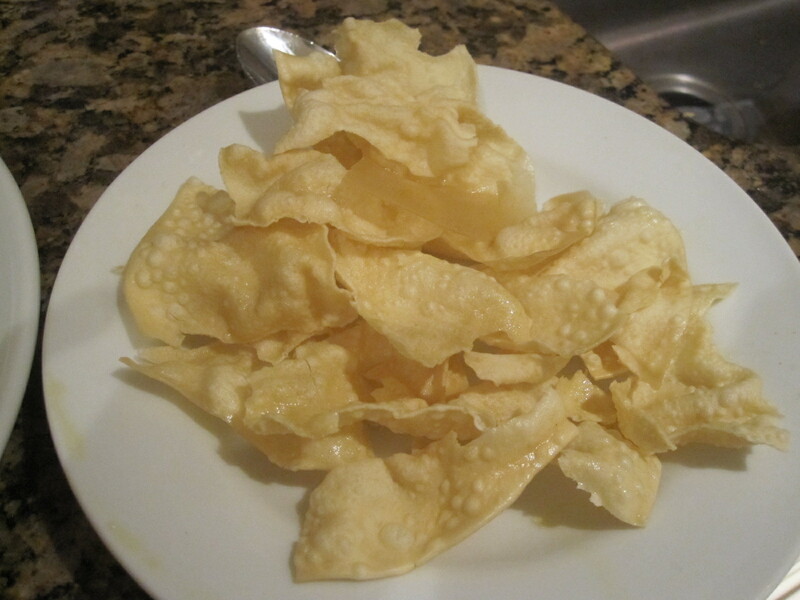 I used so much salt and pepper and even some onion powder, but it still tasted a bit bland. The veggies and chicken were perfectly cooked and it all made a hearty meal. I had no problem cleaning my plate! 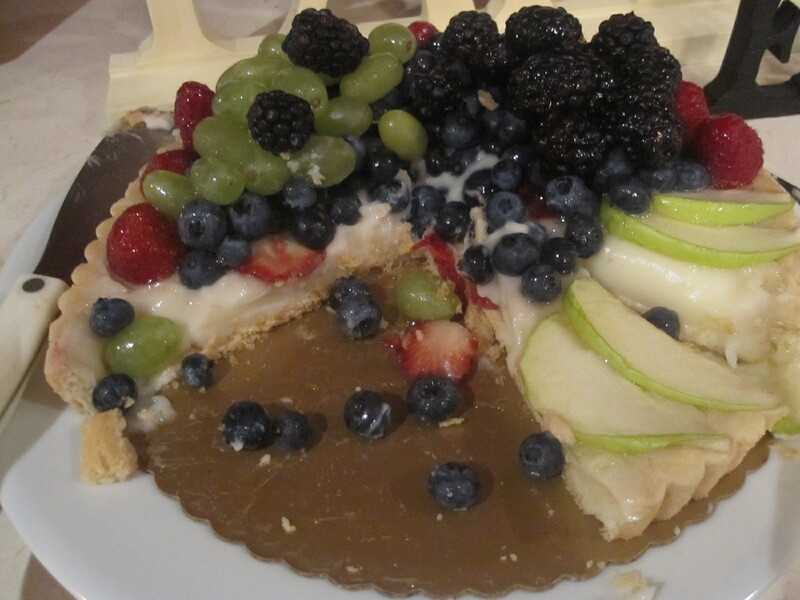 Then for dessert, one of Mom’s friends brought a Whole Foods fruit custard tart. Unfortunately, this was loaded with milk and cream so I couldn’t have it, but I managed to steal a bunch of fruit off the top! For my dessert, a lactose-friendly bowl of LaLoos Goat’s Milk Strawberry Balsamic Ice Cream with some Reddi-Whip and a crushed amaretti cookie…on a fancy plate. I think this might be my favorite ice cream currently. 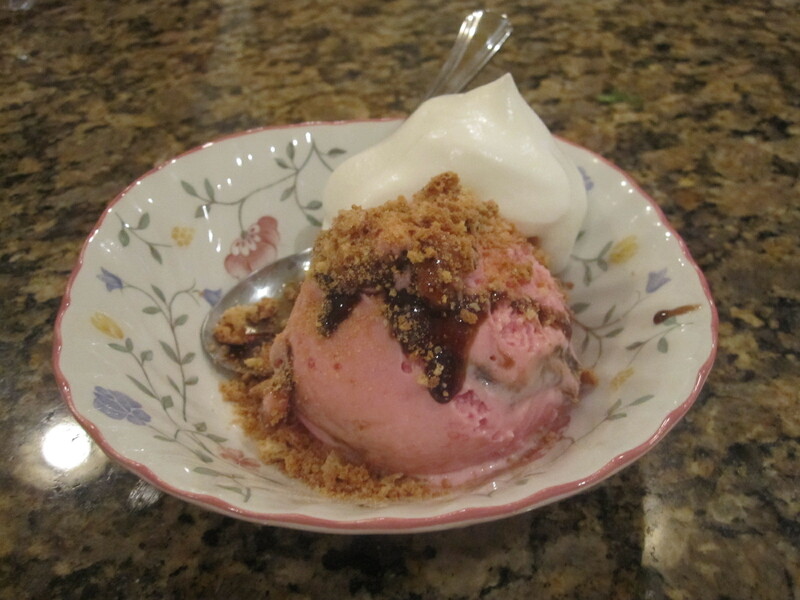 I am a HUGE fan of anything with strawberries, and the addition of the balsamic syrup gives it a luxurious taste. For breakfast yesterday, I woke up anticipating a six miler but ended up pushing it back until later on in the day as I didn’t get much sleep. 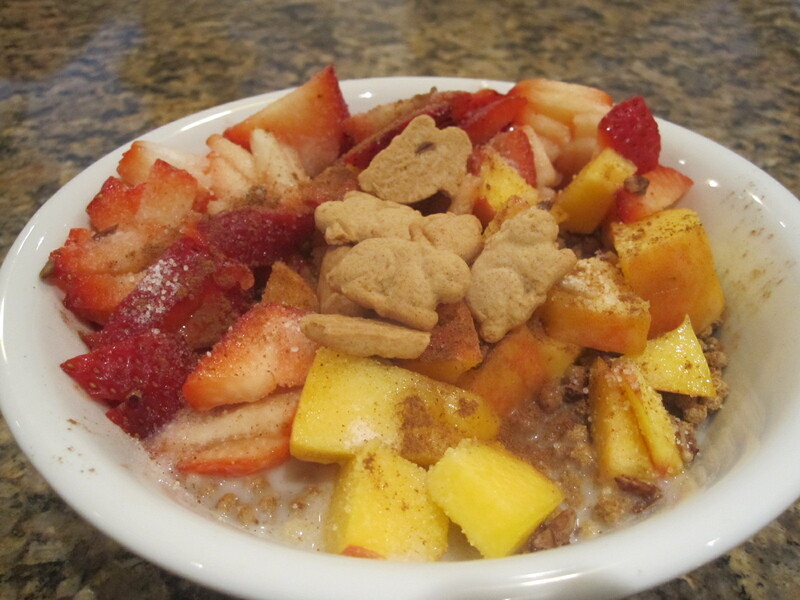 I settled for a big cereal bowl: almond milk, one Weetabix biscuit, 1/2 cup Raisin Bran, 1/4 c Bran Buds, 1 peach, strawberries, blueberries, and the last few Cinnamon Bunnies in my box. Cool and refreshing, and loaded with fiber, which was good as I was feeling a bit icky from all the food I had eaten the night before! 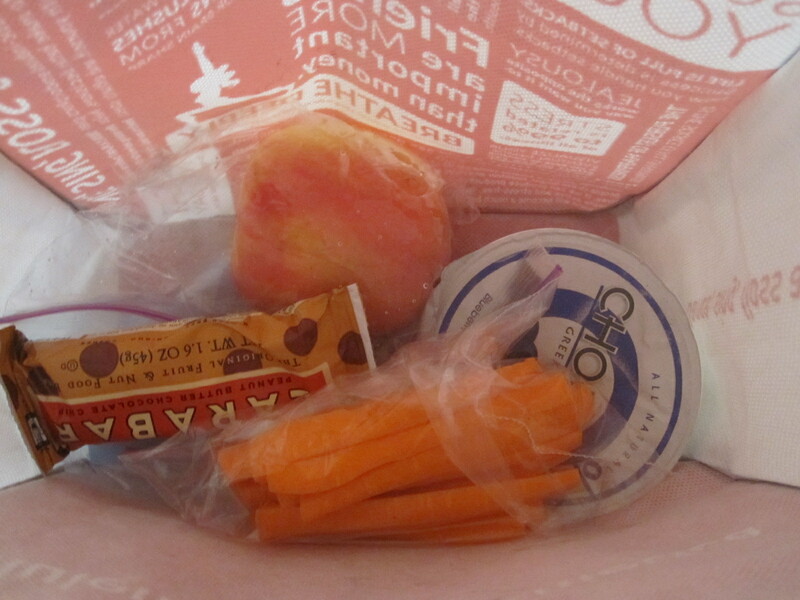 I packed a picnicky lunch for school: sliced carrots, Blueberry Chobani, Fuji Apple, and FINALLY, the Chocolate Chip Peanut Butter Larabar! Oh. My. God. Screw peanut butter chocolate chip cookies. This is the real deal. I want to make a brownie with this ingredient list: peanuts, dates, salt, chocolate chips, vanilla. That’s IT. When I got home from class, I went grocery shopping (and found Edy’s Pumpkin Pie ice cream! ), then came home and prepped for a 5 mile run. I took it down from 6 as I hadn’t gotten enough sleep, and I knew if I wanted to avoid hurricane weather I should take my run to the treadmill. Prior to the run I snacked on 1 wasa cracker with Better’n Peanut Butter and a big bowl of grapes, which gave me a big sugar rush and I ran the 5 miles with little to no trouble. However, I wore the wrong headband…which gave me a massive headache. 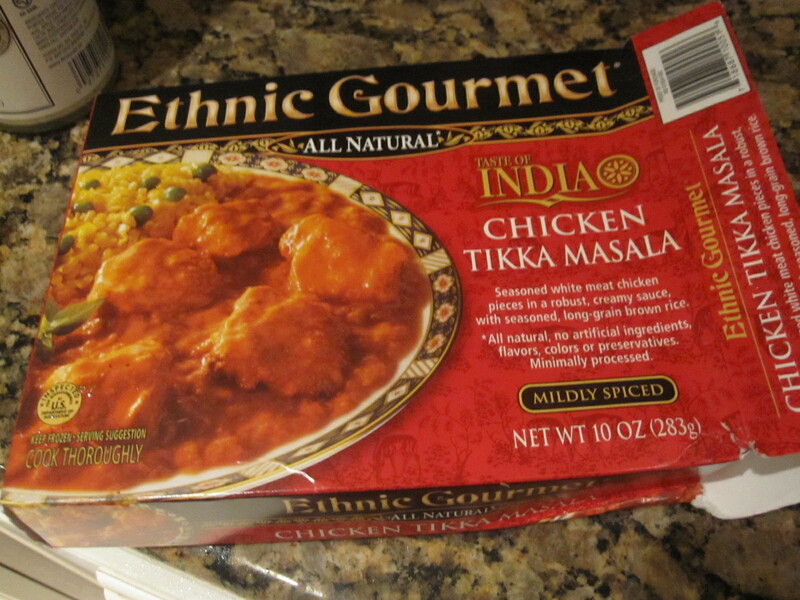 My stomach wasn’t feeling right, so my dinner was a bit of a cheat. 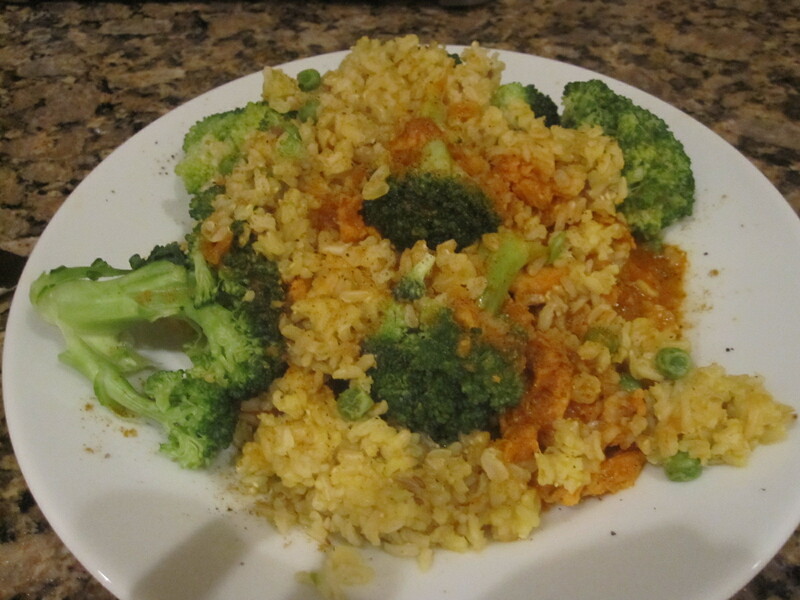 I poured this frozen dinner on top of steamed broccoli, and paired with with 2 pappadums, which I sprayed with Pam and microwaved until they were puffy and crunchy. I dipped it in the last bits of my mango chutney. RIP. 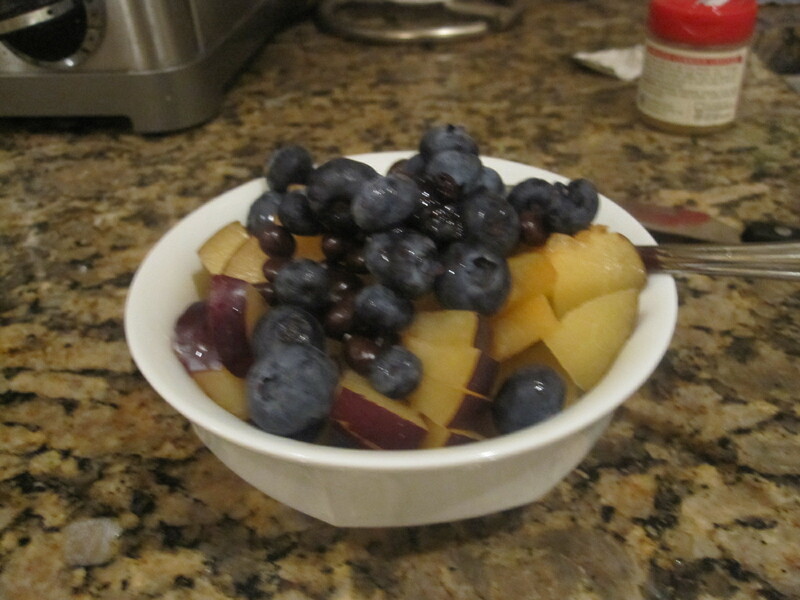 Dessert was a plum, some Cool Whip Free, blueberries and chocolate covered pomegranate arils. AND FINALLY today. Today, I woke up extra early and went to Power Yoga class, which was BRUTAL on my hips. But I need it! I need to stretch more, and not just with the foam roller. My hip flexors are locked up tighter than Fort Knox. When I got home, I threw together an autumnal meal that didn’t turn out quite like I had hoped, but still filled me up: pumpkin yogurt!! I combined 1/4 c pumpkin with Fage 0%, 1/2 tbsp protein powder, stevia, cinnamon, and nutmeg. 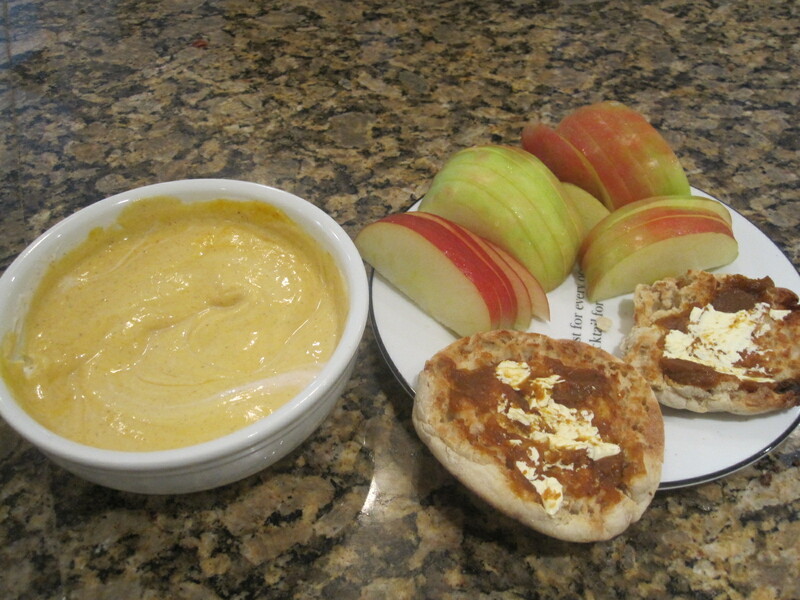 I served it with a giant Honeycrisp apple and an apple cinnamon english muffin, topped with Smart Balance and pumpkin butter. The pumpkin yogurt wasn’t very good, sadly. It was all spice and no sweetness. I shouldn’t have put the protein powder in, either…it made the yogurt grainy. Now, off to drink my coffee, and do my reading all day in the sunshine!! !